Buckden is a wonderful typical small Yorkshire Dales village situated where the River Wharfe and Buckden Gill meet. The village houses a shop, a hotel the Buck Inn and Buckden House which is a residential outdoor education centre. Every year in June on the day of the village gala the Buckden Pike Fell Race takes place, covering 4 miles and nearly 500 metres of ascent. Buckden’s bridge is the second one to be built after the first one was destroyed in a flood in 1748. It is now known as Election Bridge after an MP promised to give £200 to the building of the new bridge if he got elected. The Dales Way passes close to Buckden on the opposite bank of the River Wharfe. The village is a civil parish in the Craven district which includes Cray and the whole of Langstrothdale. Cray a hamlet situated on the steep hill above Wharfedale has a number of waterfalls collectively known as Cray Waterfalls. The hamlet about 2 miles north of Buckden consists of only a few houses, a farm and a pub the White Lion Inn which has accommodation. The 700 year old White Lion Inn was firstly a drover’s hostelry acting as a way point for farmers taking their cattle and sheep to market. It is the highest pub in Wharfedale and although it has undergone much refurbishment it still retains the traditional old English pub feel. The disused Buckden Gravel Lead Mine located on the upper part of Buckden Beck on the slopes of Buckden Pike was first mined in 1697 and the mine shafts twist and climb to follow the narrow mineral veins. The ore was smelted at Buckden High Smelt Mill, which can be seen as a ruined building at the base of the spoil, until 1706 when Buckden Low Mill took over. After 1843 the ore was smelted at Starbotton Cupola and the flue ran over 300 meters up the hill to a chimney in Cam Pastures. The mine closed around 1877 due to a drop in demand and cheap imports. In March 1964 a skeleton was found 400 yards from the entrance to the mine and the body is thought to date back to 1890. The body was never identified and was nicknamed Buckden Bill. Buckden Pike at 702m (2303ft) standing at the head of Wharfedale above Buckden village narrowly misses out on being the highest peak in the area, the highest being Great Whernside at 704m. The summit is marked by a trig point, a pile of stones and a National Trust sign saying welcome. The views are superb on a clear day to the east is the ridge running from Little Whernside to the summit of Great Whernside and to the west into the heart of the Yorkshire Dales and its Three Peaks Pen-y-Ghent, Whernside and Ingleborough. 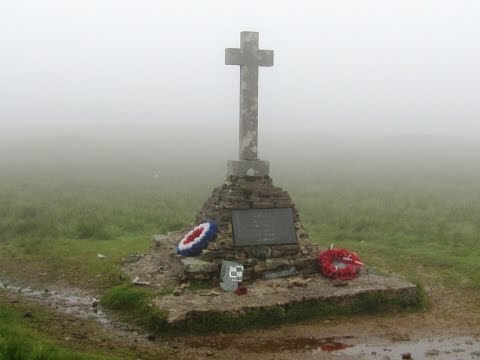 Just over half a mile south of the summit is a memorial cross dedicated to the memory of five Polish airmen of the Royal Air Force who crashed their Wellington Bomber on 30th January 1942. Hitting a bad snowstorm the six airmen clipped a 6ft high wall on Buckden Pike and careered several hundred feet along the ridge before stopping. Sergeant Joseph Fusniak dazed from the crash found he had a badly broken ankle. Although he was in agony he checked each member of the crew to find four of the men had died instantly but the wireless operator Sergeant Jan Sadowski was still alive but seriously injured. Realising they would not survive in the appalling weather conditions he wrapped Jan in a parachute to keep him warm then slid and crawled his way down the hillside to seek help in the deep snow with temperatures below zero. Hypothermia was beginning to set in but he thought of his friend and managed to pull himself over a wall and began to shout help. Figures appeared in the distant gloom, he had reached the road next to a stream near the White Lion Inn at the hamlet of Cray. He was dragged to the warmth and safety of the public house by the landlord and his daughter. They thought he was a German pilot and after convincing them he was an RAF Airmen he told them that his friend was seriously injured and awaiting urgent help. The snowdrifts were so severe a search party could not be launched until the next day. When the shattered Wellington Bomber was found it was too late, Sergeant Jan Sadowski had died. In May 1942 Sergeant Joseph Fusniak was awarded the British Empire Medal by King George VI and decorated by Chief Air Marshall Bomber Harris. Haunted by the trauma of the crash Joe re-visited the scene several times and in 1973 he decided to build the memorial cross to his greatly missed crew mates. In July 1942 Joe was blasted out of his turret on a bombing mission over Germany and held as a prisoner of war. He lives to tell his tale today – but that’s another story. From Buckden car park we take the footpath going through a gate then turn immediate right on the grass path going steeply uphill signposted Buckden Lead Mine and Starbotton. We go over a stile and head downhill to cross over Buckden Beck via the stepping stones. We then keep following the track steadily uphill. The stony track becomes a grassy track and we pass though some gaps in the broken walls. When we reach an unbroken wall the path bears round to the left heading to a signpost. We keep bearing left heading uphill following a wall on our left. We see another signpost for Buckden Lead Mine and keep bearing left uphill. We go through a wooden gate and head forwards past a yellow marker post to a wall corner also with a yellow marker. We go over the stile and head forwards downhill following the wall on our left then across the open field until we reach the lead mine. We take a look round then take the path above the mine turning right uphill. We keep following the path to a wall corner and keep heading uphill away from the wall until we meet a wall on our left. We follow the wall on our left until we reach the corner of the field at a stile in the wall and a wooden ladder stile. We turn right and follow the flag stones with the wall on our left to the Polish War Memorial. (There is a path on the other side of the wall but erosion has taken place.) After about half a mile we cross over a ladder stile in the corner of the wall to take a look at the War Memorial just on the other side. We go back over the ladder stile then retrace our steps now with the wall on our right back to the next ladder stile. We go over the ladder stile and head forwards to the summit of Buckden Pike marked with a trig point. We then keep heading forwards with the wall on our right. The stony track starts to go downhill and then at a public bridle way signpost we follow it and keep heading downhill. The bridle way bears left and we keep heading downhill through a gate and then a broken wall. We eventually come to a stony track signposted Buckden we turn left and keep heading downhill back to Buckden car park. This is a moderate to hard walk on well walked paths and tracks with steep inclines and declines. Approx 6 miles allow 3 to 4 hours using OS Explorer Map OL30, Yorkshire Dales Northern and Central areas. Wensleydale, Swaledale. Start point: Buckden pay and display car park £4.20 for all day. Buckden is in Warfedale in the Yorkshire Dales. From the A1 take the A61 to Ripon. At Ripon take the B6265 through Risplith and Pateley Bridge, past Hebden and Grassington. At the t-junction at Threshfield turn right onto the B6160. By-pass Conistone, through Kilnsey, Kettlewell and Starbotton still on the B6160 then Buckden is approx another 4 miles. Parking: Buckden pay and display car park £4.20 for all day. There are public toilets in the car park and for refreshments there is a shop and the Buck Inn with accommodation. Nearby at Cray there is the White Lion Inn and at Starbotton the Fox and Hounds. The next nearest public toilets and refreshments are at Kettlewell.